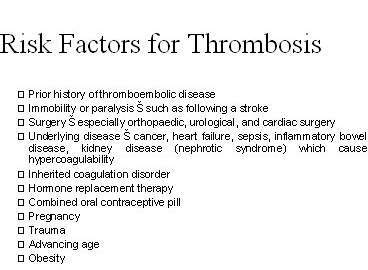 Venous thromboembolism is the third most common cardiovascular disease after heart attack and stroke. Venous thromboembolism can lead to deep vein thromboses and pulmonary embolisms. Several factors can predispose people to increased risk of developing DVT or PE. Patients undergoing major orthopaedic surgery are at an especially high risk of developing venous thromboembolism. In clinical use for some 50 years, the vitamin K antagonist warfarin remains the standard long-term oral anticoagulant. However, warfarin has a number of significant drawbacks driving the search for safer and more effective oral anticoagulants. Pradaxa is a new oral anticoagulant under development by Boehringer Ingelheim. It has a rapid onset and offset of action and predictable anticoagulation action, eliminating the need for coagulation monitoring. Pradaxa (dabigatran etexilate) is an oral anticoagulant under development by Boehringer Ingelheim. Its primary indication is for prevention of venous thromboembolism (VTE) following orthopaedic surgery, such as operations for total hip and total knee replacement. Within a year of filing for regulatory approval with the European Medicines Agency in early 2007, the company received positive news that the Committee for Medicinal Products in Human Use had recommended Pradaxa’s approval for thromboprophylaxis. In March 2008, Pradaxa was granted marketing approval by the European Commission to sell the drug in the 27 EU countries. Boehringer is now in the process of launching the drug for this indication in the UK and Germany. The drug has also received marketing approvals from New Zealand, Argentina, Canada and Brazil. The results of Phase III RE-LY study on the drug were announced in 2009, and the drug received FDA approval for preventing stroke risk in patients with atrial fibrillation in October 2010. The Japanese Ministry of Health, Labour and Welfare approved the drug (under the name Prazaxa) for the same indication in January 2011. The Committee for Medicinal Products for Human Use suggested changes to the terms of the marketing authorisation of the drug in April 2011. In December 2011, the FDA provided a safety announcement for Pradaxa following reports of excessive bleeding in patients. The FDA is currently evaluating these reports and will provide further information after completion of evaluation. 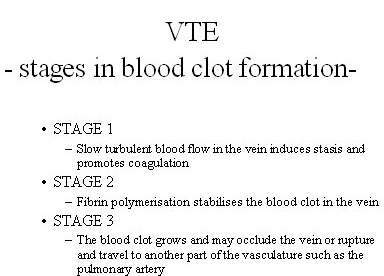 VTE is the formation of a blood clot or thrombus in the vein, which may occlude the vein or rupture and lodge elsewhere in the body, such as an artery. VTE encompasses both deep-vein thrombosis (DVT) and pulmonary embolism (PE), in which clots formed in the deep veins of the leg rupture and become lodged in the pulmonary artery. 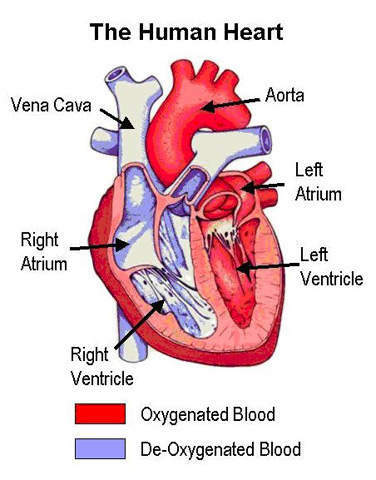 After heart attack and stroke, it is the third most common cardiovascular disease. Patients undergoing major orthopaedic surgery (hip or knee replacements and hip fracture) are at an especially high risk of developing VTE. Without anticoagulant therapy, between 40% and 50% of patients undergoing hip replacement surgery suffer VTE. This rises to 70–80% in hip fracture surgery. 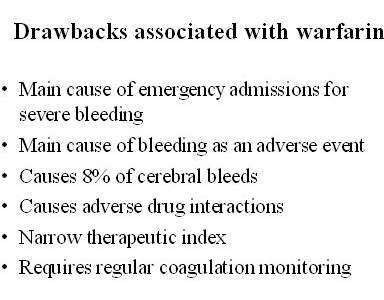 "The drawbacks associated with warfarin have spurred the search for alternative orally administered drugs." In clinical use for some 50 years, the vitamin K antagonist warfarin remains the standard long-term oral anticoagulant. Although effective when well managed, it has a number of significant drawbacks that can have potential thrombotic and haemorrhagic consequences. Thromboprophylaxis with warfarin is influenced by genetic differences in metabolism, concurrent medication use, vitamin K intake, drug interactions, and alcohol consumption among others. Thus, to keep patients within the International Normalised Ratio (INR) target range, daily maintenance doses of warfarin can vary from less than 1mg / day to more than 20mg / day. This necessitates regular coagulation monitoring and dosage adjustments. Warfarin is an indirect thrombin inhibitor and depletes vitamin K-dependent clotting factors, particularly prothrombin, when exerting its antithrombotic effect. Pharmacologically this results in a slow onset of action. Thus, when rapid anticoagulation is indicated, patients have to take overlapping parenteral antithrombin therapy with heparins. Finally, warfarin has a long half-life, which together with the half-life of the vitamin K-dependent clotting factors slows its offset of action. minimal interaction with food or drugs. Studies on Pradaxa indicate that this new oral anticoagulant has a rapid onset and offset of action and predictable anticoagulation action, removing the need for coagulation monitoring. There is also no evidence to suggest it interacts with food, while its potential to interact with other drugs is considered low. Clinical trials involved more than 8,000 patients who had undergone either total knee replacement) or total hip replacement surgery. 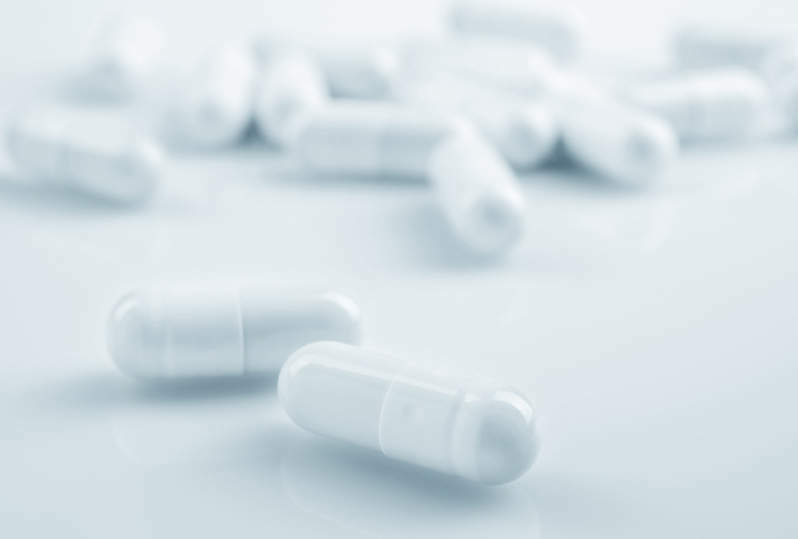 Clinical data from the two European trials, RE-NOVATETM and RE-MODELTM, included regulatory submissions to the European medicines Agency, support the clinical efficacy of Pradaxa in VTE prevention. At doses of 150mg or 220mg, orally administered Pradaxa proved as safe and effective as the injectable low-molecular weight heparin, enoxaparin 40mg, in preventing VTE and all cause mortality following total hip and knee replacement surgery. Incidence of major bleeding, the main safety concern with thromboprophylaxis, was comparable between treatment arms and low in both trials (range 1.3–2.0%). Likewise, the incidence of raised hepatic enzyme levels was similar between treatment arms. "Patients given a 150mg dose of Pradaxa had a 34% lower risk of stroke or systemic embolism than patients given Wafarin." Another study named REMOBILIZE, conducted in North America on patients who had undergone total knee replacement surgery, did not meet the primary end point. Patients were administered 30mg twice a day in the REMOBILIZE study, compared to 40mg once daily given to patients in other studies. Pradaxa’s first indication is for VTE prevention. 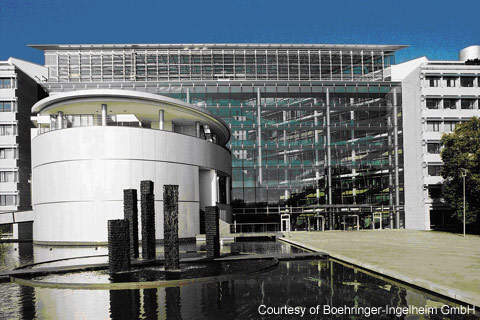 Boehringer completed the Phase III Randomised Evaluation of Long-Term Anticoagulant Therapy (RE-LY) study of the drug in 2007, and the results were disclosed in 2009. A total of 18,113 non-valvular atrial fibrillation patients with at least one risk factor for stroke were enrolled for two years and were administered randomised treatment with Wafarin or Pradaxa. The results indicated that the patients who were administered with a 150mg dose of Pradaxa had a 34% lower risk of stroke or systemic embolism than patients given Wafarin. Another ongoing study, RELY ABLE, has enrolled around 6,200 patients.Results of the study are expected to be released in April 2013. "Two other oral anticoagulants are waiting in wings that are likely to challenge Pradaxa." Developing a suitable alternative to Warfarin has been the driving force of anticoagulant research for years. Hopes were first raised at the end of 2003 when Exanta (ximelagatran), an oral direct thrombin inhibitor, was approved in Europe. However, they were subsequently dashed when it was withdrawn from the market in 2006 because of hepatic toxicity. Hopes have now been raised again with European Medicines Agency approval of Pradaxa. Two other oral anticoagulants are waiting in wings that are likely to challenge Pradaxa in the thromboprophylaxis market: Bayer’s Xarelto (rivaroxaban) and Bristol-Myers Squibb’s/Pfizer’s apixaban.